I’m working on something new, something a bit, well… different. 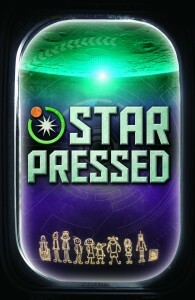 STAR PRESSED is a story about family. It’s not quite a kids book, it’s not exactly YA, and it’s not fully a grown-up read either. It’s a story about eight “people”, three adults and five teenagers thrown together by fate, facing a world they don’t understand, and who ultimately choose to stay together…as a family. It’s science fiction, a bit of a love letter to Lost In Space, Star Trek, Star Wars, and submarine stories. Think: Guardians of the Galaxy meets Party of Five. In the spirit of sharing, I’ve put the first 10 chapters up on Wattpad. If you’ve followed this blog, you’ll know I’m a big fan of wattpad, the global storytelling app that lets readers and writers connect in a digital space (the best description I’ve heard is that it’s “youtube” for creative writing). 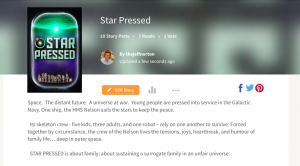 I hope you check out STAR PRESSED, and I’d love to hear your thoughts.